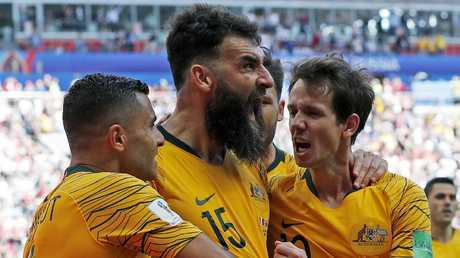 TIME was ticking but, just like every penalty he took, Mile Jedinak moved decisively and left a nation cheering in his wake. The Socceroos captain, the bold, bearded stalwart who'd led Australia to the latter two of his three World Cups and the historic 2015 Asian Cup, called time on his decade-long international career late on Monday. With the Aston Villa man aged 34, speculation had been swirling about his green-and-gold future under the youth-forward approach of new national-team coach Graham Arnold. And, following "much deliberation" three months out from January's Asian-Cup defence, he took matters into his own hands. "Words will never be able to do justice the feeling of immense pride I felt when representing Australia," Jedinak wrote on Instagram. "However, after a huge amount of time reflecting and discussing with those closest with me, I feel that it is the right time to move aside in order to focus on my club football and prolonging that journey. "Looking back, I feel blessed to be able to leave with memories that will last a lifetime. The feeling of captaining our country to Asian Cup glory in 2015, and to have been able to contribute to achieving success for Australia, will stay with me forever. "Additionally being able to captain the team, and score, in two World Cups is something I could only have dreamed about as a boy. There are just too many highlights to mention them all." Chief among them will be skippering the Socceroos at the Brazil 2014 and Russia 2018 World Cups, where he led from the defensive midfield and scored three times - all penalties. For just as Tim Cahill was a hero inside the area, Jedinak was a talisman from the spot. Time and again the former Crystal Palace captain came to fore, highlighted by his hat-trick in a play-off against Honduras last November to seal the Socceroos' qualification for a fourth consecutive showpiece. Once there he scored Australia's only two goals against France and Denmark and played every minute of every group match in what would mark his final appearances. His international career reads a total 79 caps and 20 goals, a haul quickly praised by pundits, the public and his Socceroos teammates. 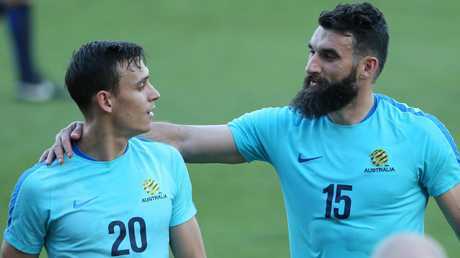 Trent Sainsbury, widely tipped to inherit the armband, described Jedinak as an "absolute legend", while Cahill called him "an amazing leader". 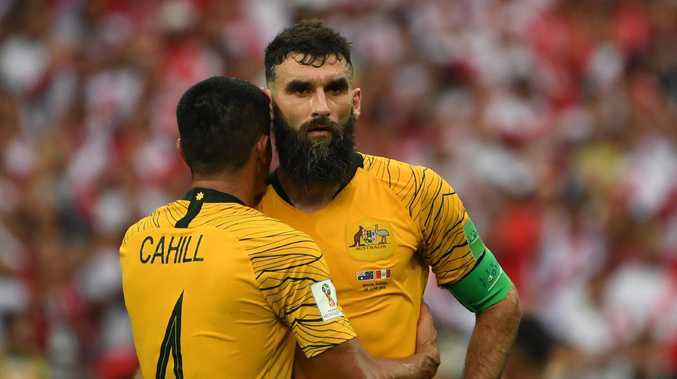 "Most of all your character and friendship is priceless," Cahill replied to Jedinak's post. "You will be a massive loss for our country but I respect your decision my friend. To lift silverware together for our country is something I'll never forget which is one of many great memories together." Goalkeeper Mat Ryan thanked him for "all the little lessons" about what it took to be an international footballer. "Brother, has been a great privilege standing alongside you and to have been able to share some of those countless memories," Ryan wrote. Future skipper Trent Sainsbury and Mile Jedinak. Picture: Jono Searle. Arnold, who picked Jedinak for his first training camp in Turkey last month but did not guarantee Asian Cup selection, joined the tributes in a statement. "Mile has been a great leader for the Socceroos and great player for Australia," Arnold said. "He is held in fantastic regard by his teammates, the coaches and staff that have worked with him, as well as the fans. "I congratulate Mile on a superb international career, and now look forward to seeing other squad members step up as Socceroos leaders after the international retirements of Mile and Tim Cahill."